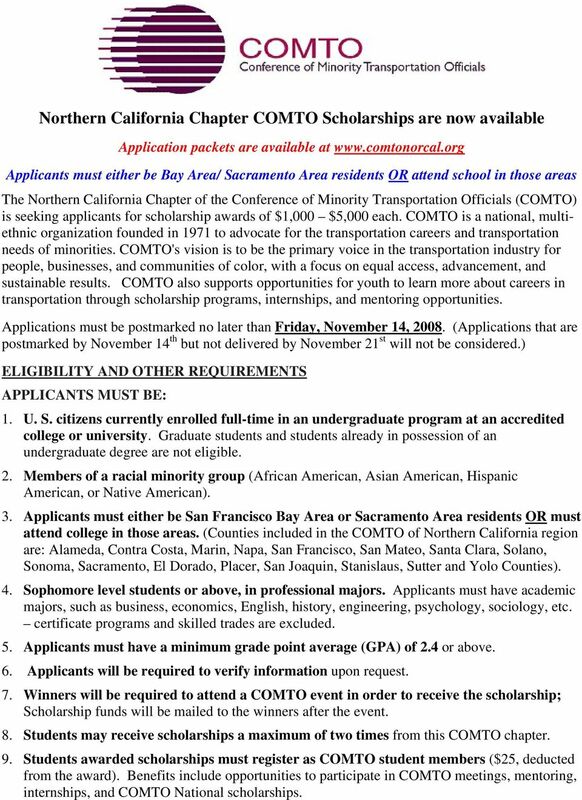 Download "Northern California Chapter COMTO Scholarships are now available"
1 Northern California Chapter COMTO Scholarships are now available Application packets are available at Applicants must either be Bay Area/ Sacramento Area residents OR attend school in those areas The Northern California Chapter of the Conference of Minority Transportation Officials (COMTO) is seeking applicants for scholarship awards of $1,000 $5,000 each. 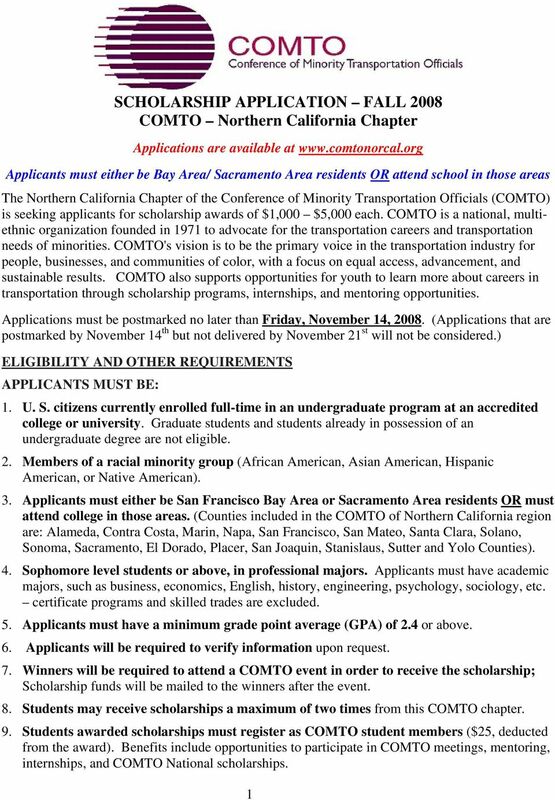 COMTO is a national, multiethnic organization founded in 1971 to advocate for the transportation careers and transportation needs of minorities. COMTO's vision is to be the primary voice in the transportation industry for people, businesses, and communities of color, with a focus on equal access, advancement, and sustainable results. 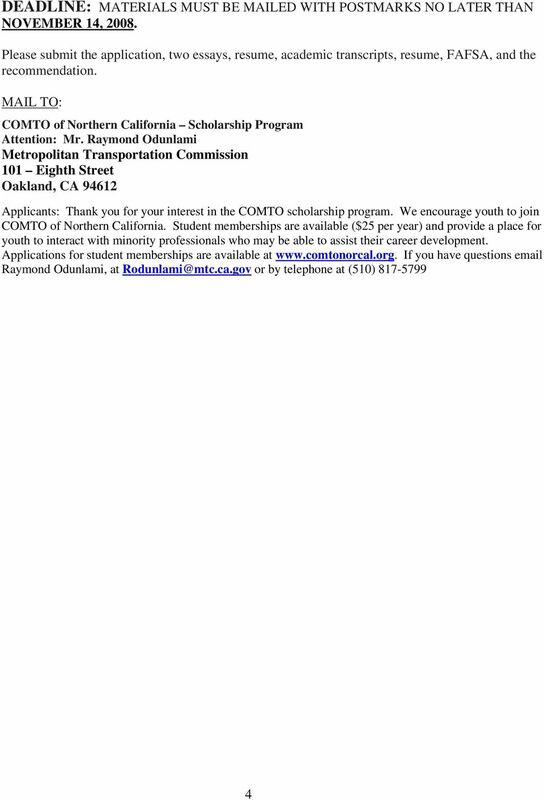 COMTO also supports opportunities for youth to learn more about careers in transportation through scholarship programs, internships, and mentoring opportunities. 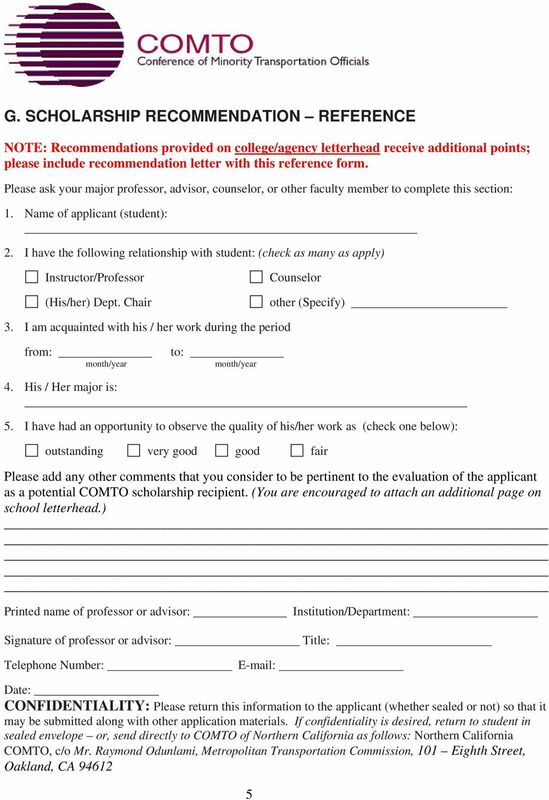 Applications must be postmarked no later than Friday, November 14, (Applications that are postmarked by November 14 th but not delivered by November 21 st will not be considered.) ELIGIBILITY AND OTHER REQUIREMENTS APPLICANTS MUST BE: 1. 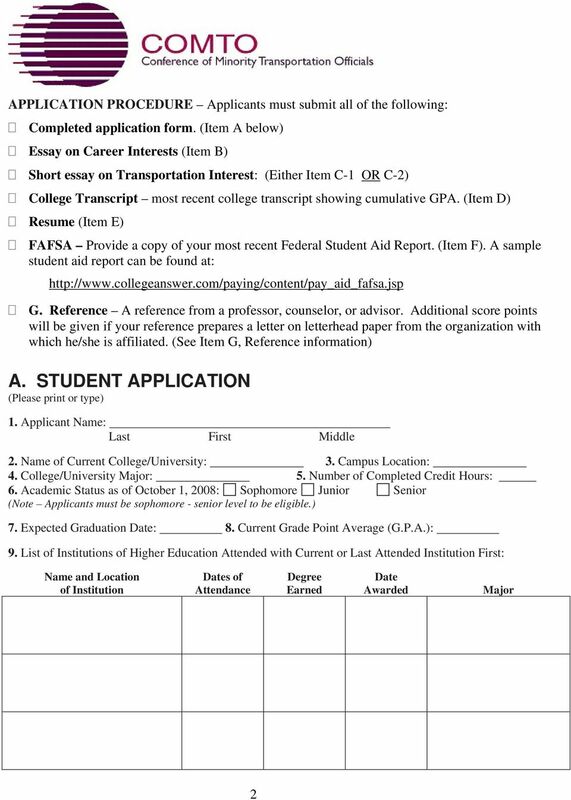 U. S. citizens currently enrolled full-time in an undergraduate program at an accredited college or university. Graduate students and students already in possession of an undergraduate degree are not eligible. 2. Members of a racial minority group (African American, Asian American, Hispanic American, or Native American). 3. 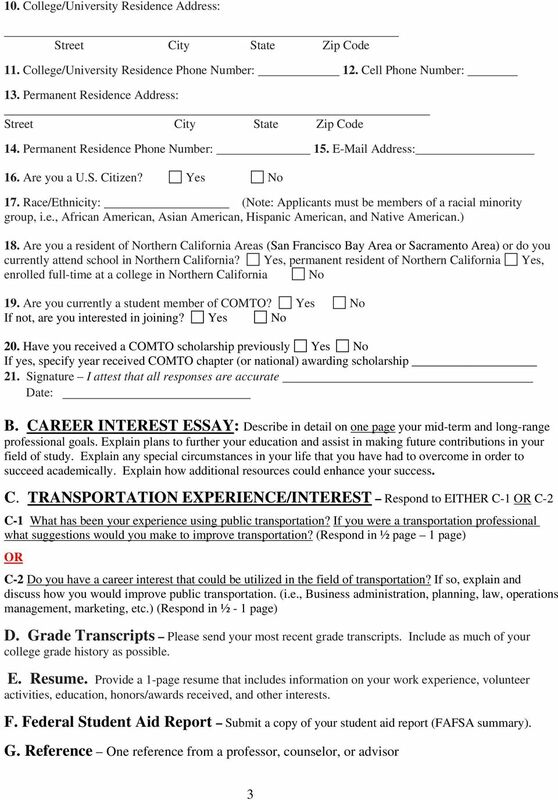 Applicants must either be San Francisco Bay Area or Sacramento Area residents OR must attend college in those areas. (Counties included in the COMTO of Northern California region are: Alameda, Contra Costa, Marin, Napa, San Francisco, San Mateo, Santa Clara, Solano, Sonoma, Sacramento, El Dorado, Placer, San Joaquin, Stanislaus, Sutter and Yolo Counties). 4. Sophomore level students or above, in professional majors. Applicants must have academic majors, such as business, economics, English, history, engineering, psychology, sociology, etc. certificate programs and skilled trades are excluded. 5. Applicants must have a minimum grade point average (GPA) of 2.4 or above. 6. Applicants will be required to verify information upon request. 7. Winners will be required to attend a COMTO event in order to receive the scholarship; Scholarship funds will be mailed to the winners after the event. 8. Students may receive scholarships a maximum of two times from this COMTO chapter. 9. Students awarded scholarships must register as COMTO student members ($25, deducted from the award). Benefits include opportunities to participate in COMTO meetings, mentoring, internships, and COMTO National scholarships.